Debi Abolt has long run an amazing site called TemariMath.Info. It is a place I have visited many times, there are mathematical studies on many aspects of temari making (many of which make my head spin to varying degrees) and there is a notebook section in which are so many amazing temari featured along with the notes kept for replicating the design. I think this site is a great resource for all temari makers and an excellent example of how to keep an organised temari notebook which records not only the basics such as the size of the ball, threads used and scratch notes on the method but also the source of the design, illustrations and notes on Debi's experience stitching each project. 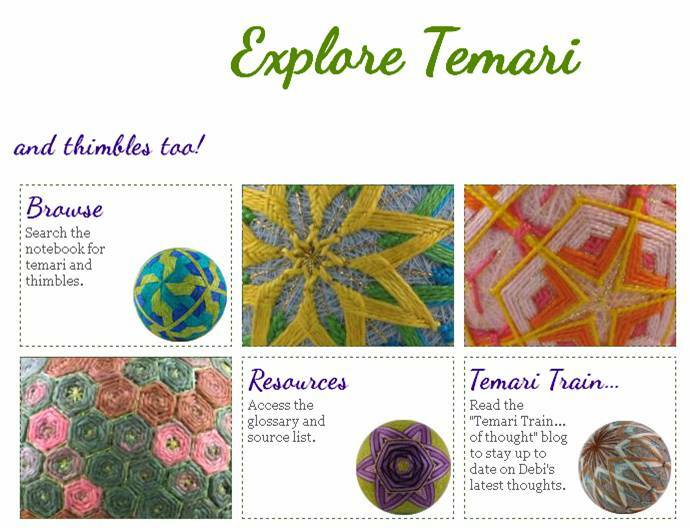 And that she is willing to share all this with the temari community WOW amazing. Did I say wow before? Well I'll say it again WOW WOW WOW what an amazing job at putting together this new website. Thanks Debi! Thanks for the endorsement Rebecca. I am really glad you like the new site. Notebook patterns will definitely be coming along (including the pink one you like). They are the next part I will be adding. Happy Stitching!